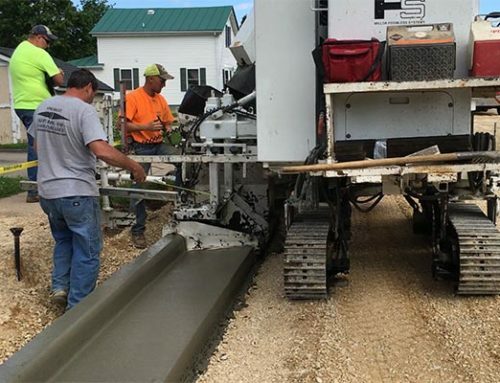 When deciding on which slipform machine to purchase, one of the basic differences between the brands is whether the machine is a 4 track or 3 track model. This is most important in a small curb machine, where size, stability, and maneuverability either contribute or detract from profitability. 4 track machines have the weight of the machine distributed across a larger area, so the ground pressure on each track is lower. 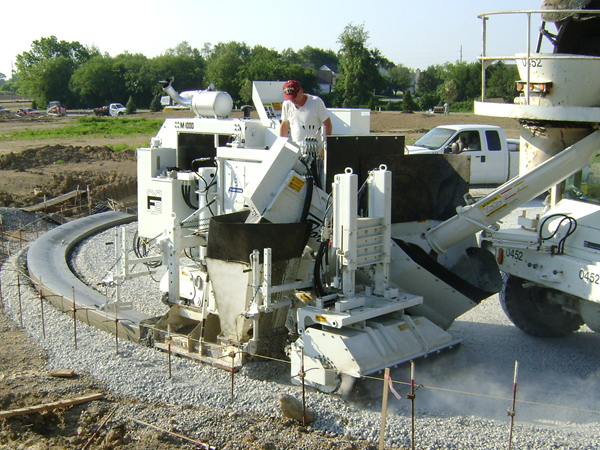 Often a 4 track machine can pour on a job site with a soft track path and a comparable 3 track machine can’t. This is apparent when doing radius work where a single track on a 3 track machine can easily dig itself into a hole while a 4 track machine with 2 tracks steering and less ground pressure will not. All Miller Formless’ machines have the elevation tubes positioned symmetrically distributing the weight of the machine on 4 tracks instead of 3. The tracks are not repositioned on the frame when changing molds or going to a different job site. This keeps the control consistent and predictable while not having to recalibrate the micro controller. Just having 4 tracks may not be enough on a small curb machine. Miller Formless’ design has been proven to control better for all size machines. What sets the design apart is the patented 3 leg, 4 track, and 5 pivot point design, which consists of a front grade track, a rear grade track, and a walking beam on the slope side of the machine connecting two tracks to the slope elevation tubes with a pivot. This permits the slope side tracks to mechanically adjust or walk over irregularities in the track path. The slope sensor sensitivity can then be set at a higher level of sensitivity to maintain very accurate control without unwanted oscillations. Traction on Miller Formless 4 track design doesn’t involve different displacement motors, flow dividers, or motor sensors, as seen on some 3 track machines. Miller Formless uses a series/parallel hydraulic setup to ensure at least 2 tracks are pulling even in muddy slippery conditions. This setup also allows the hydraulic flow to seamlessly adjust from inside track to outside track while the machine pours a radius. A significant safety feature on Miller Formless’ 4 track design, is loading onto a trailer. With a track at each corner, the weight of the machine is evenly distributed. This is very important when loading the machine onto a trailer which may not be sitting perfectly level. With the trailer at an angle and the deck muddy or slippery, a tracked machine may slide. A machine with 4 tracks will track straighter and maintain its’ position better. The last advantage to consider is wear on the track components. With the weight distributed on 4 tracks vs 3, wear on the rollers, chains, and sprockets will be less. Cost of ownership is very important to the profitability of any piece of equipment. Track rebuilding can be a major cost, both in component prices and lost time. Extending the time between rebuilds goes a long way to improving profitability and lowering ownership costs. Being profitable, building a reputation for quality workmanship, being able to perform well under less than perfect conditions, and doing it safely are the factors every contractor works for. Miller Formless builds 4 Track Slipform Machines that can enable the contractor to realize these goals.